Thank you for downloading Curtest. Click the above download link and save the file to your desk top then double click on the file to run the install program and follow the on screen instructions to install. 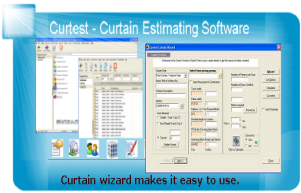 The Shop Curtain and blinds Estimating software for the soft furnishing industry and personal user. I-Curtest is an elemental estimating, products and invoicing system. If you price work using one or more basic elements such as Fabrics, Wallpapers, labour, Carpets, Upholstery etc, then you can probably save a lot of time using I-Curtest. Please click the download link below and save the file to your desktop then double click the file and follow the onscreen instructions to install the software. NOTE: I do not add you to to a mailing list unless you ask to be added. The first dialog box of the software is the payment screen for I-Curtest if you want to Buy the software just click on the BUY NOW button and pay through Paypal or you can click the continue button to enter I-Curtest as a guest user demo mode, just select user and enter in your name to get access. Please download a copy of I- Curtest Today.